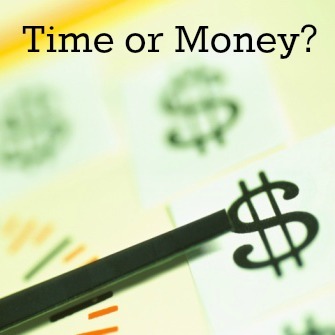 Money or Time: What's More Valuable? Home / Life / Money or Time: What's More Valuable? Money or Time: What’s More Valuable? In the quest to save money or make money, it’s easy to get caught up in the strictly financial aspects of what you’re doing. After all, if you want money â€“ whether you are trying to get the best deal on something, or trying to earn a few extra bucks â€“ it doesn’t matter how long it takes you to get that money. You’ll do what it takes when it comes to the bottom line. But what are you giving up? While money, to some degree, is a necessity when it comes to survival, is it the most important thing? And are there things more valuable than money? Before getting too wrapped in how much money you’re going to earn, or how much money you’re going to save, consider also thinking about how much time you’re going to spend. To a certain extent, you can always earn a little more money. However, once you spend your time, it’s gone forever. You can’t get that time back. From that standpoint, time might actually be more valuable than money. While you might be able to save $30 by changing your oil, how fast can you do it? And what could you be doing with that time instead? Will spending another hour on your pet project to earn another $50 worth the sacrifice of time you could have spent playing with your kids? You might be making a trade, turning in valuable time for money. Of course, not everyone has the choice to decide whether or not to trade time for money. In some cases, it’s practically a requirement to give up some time in order to get the money that’s needed to survive on a day-to-day basis. If you don’t have that choice, then, perhaps, time becomes even more valuable. At some point, the goal is often to reach a level of financial freedom that allows for that choice to be made. If you are working and sacrificing your time to save more or to earn more, it’s likely that you also hope to one day be able to have more control over your time. Financial freedom can buy you a greater ability to decide what you will do with your time. It’s not just about being able to spend your money on the things you want to buy; financial freedom also allows you a choice. When you work to achieve financial freedom, you are also working to get to a place in your financial life where you don’t have to always trade time for money. It’s the ability to decide that you are going to forgo that extra $100 so that you can spend time with a loved one, or relax and enjoy your favorite hobby. It’s worth it to take a little time to think about the value of money vs. the value of time. Understanding how financial freedom “buys” you time, as well as the ability to buy items that you want, can provide you with a framework for moving forward with the lifestyle you want. What do you think? Is time more valuable than money? Leave a comment! Will this article help you save or earn more money? Get others like it simply by entering your email address below. Your email is used only for delivering daily money tips and you can opt out of delivery at any time. Click here to see all your free subscription options. Miranda writes about personal finance almost every day. An experienced freelance writer, she's covered your money online and in print from every angle and is always looking for new ones. One Response to Money or Time: What’s More Valuable? I think to me its almost a foregone conclusion. Time is way more valuable than money. Its usually said time is money but not the other way round. Maybe to summarize it succintly, I inherited this humongous portrait from my grandmother with this words etched on it, “Time is the most valuable thing a man can spend”…those words ring quite true. Great post! Enter Your Email below to request free access to the member newsletter and article updates. I'm Ben Edwards and I've been addicted to personal finance since I was 12 years old. Copyright © 2006 - 2019 Money Smart Life All Rights Reserved.